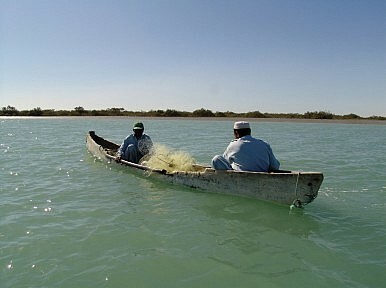 Fishermen prepare to cast their net near Pakistan's Gwadar deep-sea port on the Arabian Sea (March 19, 2007). Perched atop rocky outcroppings on the shores of the Arabian Sea, with breathtaking views from a large promontory known locally as Koh-e-Batilis, sits the port of Gwadar, which also happens to be the epicenter of the China-Pakistan Economic Corridor (CPEC). With this project, China plans to connect one of the most neglected of its western provinces, Xinjiang, with the port of Gwadar in Balochistan, Pakistan. It has announced an investment of $46 billion for the creation of CPEC, which includes energy, fiber optics and industry-based projects in Pakistan. China vows that the project will bring unprecedented economic development to both countries. CPEC is a very important part of China’s larger, ambitious “One Belt, One Road” plan (OBOR). OBOR is a grand strategy by which China aspires to stretch its economic reach over three continents – Asia, Europe, and Africa – while connecting them via maritime routes and rail links. Gwadar, where China is building a deep-sea port, is the heart of CPEC. What is being ignored, however, is that around 70-80 percent of the locals there are dependent on fishing, and at the moment they fear being crushed under the weight of the CPEC flagship. As reported by local fisherman and other stakeholders, the project is not allowing fishing to continue, and will be closing Gwadar’s jetty. The Pearl-Continental Hotel – the only one of its kind in all of Balochistan – looks out upon the beautiful Gwadar coastline from its vantage point on the Koh-e-Batil. K.B Firaq, a social activist and author, says that whenever there is an important seminar, conference, or event at the Pearl-Continental or anywhere nearby – sometimes not even that near – the jetty is closed for security reasons, and people’s movements are restricted as well. Fishermen suffer, but none of the officials there seem to care. The jetty is the heart of fish trading, and Firaq worries about how the fishermen will spend their days when the jetty closes. Where will they get their food? He is surprised by how many times banners are posted near the jetty announcing that it is closed for a day, sometimes longer. And the closure of the jetty is only one problem. The Expressway, a road that will connect to the port, is being built on the east bank of Gwadar. It is rumored the construction will uproot locals. Another road project undertaken by the Gwadar Development Authority on the west bank is not only crushing the small-boat-making industry, Firaq says, but it is also ruining the natural beauty of Gwadar where people come to enjoy the scenery and let the children play. “It is worth noting that not only would the fishermen suffer from the closure of the jetty and the development of the Expressway, but there is a chain of others who would also suffer – boat makers, oil factories, middle men, and buyers. True development brings change in the living standard of the downtrodden. It does not make them more vulnerable. But I hope the government will help those affected,” Firaq added. Syed Essa Noori, member of National Assembly from District Gwadar, told me that he has raised the issue of the fishermen of Gwadar in a grievance concerning CPEC on the floor of the National Assembly, but with no result. The government says it is planning to shift the native population (mostly fishermen) but Noori says they have been given no concrete proposal for doing so. Sadly, fishermen are sometimes not allowed to park their boats on the jetty, nor are they offered a place on another jetty. Gwadar, with the largest coastline of Pakistan (600 km), is overburdened by numerous issues that neither the provincial nor federal government seem interesting in finding pragmatic solutions for. Mr. Khudadad, coordinator of the Balochistan Fishermen Network, told me that he sees no clear plan by the government to address the dilemma of the fishermen. He feels that the government is either reluctant or in a state of limbo. He says it is the duty of the state to give every fisherman his due rights, but rather than helping its citizens, the government is giving them more problems. Development can never be called true development unless it addresses the issues of the common people. Khudadad appeals to the concerned authorities to take practical steps to end the menaces which fishermen are facing. He explained that trawling is a type of illegal fishing that eliminates sea species along with their eggs, and it happens with frequency in District Gwadar. Before 2014, per the stated rules of the Balochistan Fisheries Department, if any trawler were to be caught, it would be fined a minimum of 300,000 and a maximum of 600,000 rupees (from $2,800 to $5,700). In just one month, about six trawlers were caught and fined. The amount was deposited into the account of the fisheries and employees got salaries from that amount as well. But in 2014 the Balochistan government amended the rules of the Fisheries Department; they now state that any trawler caught trawling would be seized. To date, the official told me, about eight trawlers have been caught and seized; however, the dilemma is that the Fisheries Department does not seem serious about dealing with illegal trawlers and mysteriously allows them to eliminate sea species with impunity. This is a very dangerous situation. And in terms of the depletion of country’s fish resources, it must be noted that tensions over the threat to fishermen’s livelihoods have been building for several months, ever since the Fisheries Department disclosed its plan to issue about 100 licenses to various types of foreign fishing vessels to operate in its exclusive economic zone (20-200 nautical miles from the coast). This plan was immediately condemned by both the Pak Fisheries Exporters Association and the Pakistan Fisherfolk Forum, and raises even more concerns. But the plight of the Gwadar fisherman is one of the neglected concerns of the CPEC plan. I. A. Rehman, secretary general of the Human Rights Commission of Pakistan, points out that these fishermen are the original inhabitants of the land. They have been living there for centuries, and fishing is their only source of income. He feels the attitude of the state toward these fishermen is condemnable. No one should have to surrender his fundamental rights, and for these fisherman, they include the right to fish. Neither the government of Balochistan nor the federal government should be ordering the fisherman to vacate the jetty unless they are involved in the decision and they agree to it by virtue of their being accommodated in some way or by giving them an alternate means of earning a living. Without the consent of the fisherman, no outcome would be fruitful. Bezanjo further added that the coasts of Balochistan and Sindh are in the “Red Area,” which is in a very precarious state. In this area, sea species are in danger of being wiped out by trawlers. Trawling is banned internationally, and he says the menace is being dealt with. Work is being done to put an end to trawling and protect the species that are endangered. It is obvious that CPEC has some problems it needs to address. It is a vital project that vows to bring an economic boon to the countries that are part of it. But it is high time that the state ensures that no one gets left behind. Fishermen need to be made part of Gwadar’s development rather than being sidelines. They still use outdated fishing techniques, and they need to be trained in modern ways. Setting up a technical institute in Gwadar to teach locals about the changing environment and the latest fishing techniques would be an inclusive gesture and would show them they have not been forgotten. Furthermore, there should be no “looking the other way” when it comes to trawling. Whosoever is involved in this illegal activity must be brought to justice. Shah Meer is a fellow of the Swedish Institute and the Institute for Foreign Cultural Relations. He graduated from NUML in International Relations and researches South Asian politics, Balochistan issues and human rights. He is from Pasni, District Gwadar, Balochistan.